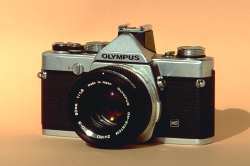 The Olympus OM1 is the first of the vast OM System. Introduced in 1969, this camera deserves a place here because it is one of the first (if not the very first) reflex that was compact, lightweight and full-featured. First of the OM System, it has amazing capabilities for its time : TTL light meter and flash, interchangeable viewing screens, mirror lock-up, lots of various lenses... all of this packed in a 500g compact and reliable body. Its reliability made it very popular among scientists as well as professional and amateur astronomers, hence an impressive range of dedicated accessories.